A common question we receive is “What is the difference between SOLIDWORKS® Standard, Professional and Premium 3D CAD software?” In this post I’ll provide a SOLIDWORKS Packages Comparison and outline the features included in each of the three SOLIDWORKS offerings. 3D Solid Modeling: Accelerate your design, increase productivity, and reduce cost with 3D solid modeling with lifelike visualization and virtual testing before manufacturing. Large Assembly Design: Simplify design of large assemblies with easy-to-use tools to create, manage, and visualize large and complex designs that can contain more than 100,000 parts. 3D Animations and Basic Rendering: Quickly and easily create powerful images and animations to communicate your design intent and functionality. First Pass Design Analysis: Verify operation and performance while creating your design with fully integrated wizard driven simulation and analysis tools. 2D Drawings: Create production-ready 2D drawings that communicate how your design should be manufactured and assembled. Sheet Metal Design: Quickly and cost-effectively create a wide range of sheet metal part designs using a wide range of flexible tools to meet your specific needs. Weldments: Quickly create designs that have extrusions and easily generate cut lists and bills of materials to streamline design and manufacturing of welded structures, frames, and bases. 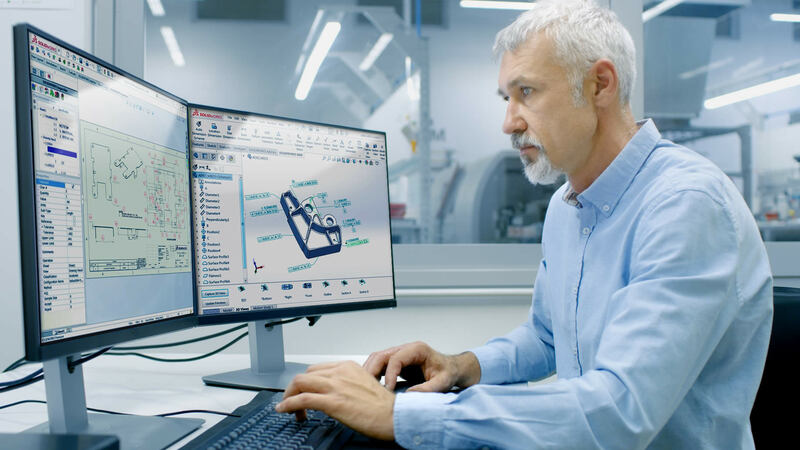 Mold Design: Simplify mold design with fully integrated product design, mold design, and validation that updates all part files automatically to enable changes right up to final manufacturing. CAD Import and Export: Accelerate design, save time and development costs, and increase productivity by converting CAD data into a format that meets your design needs. You can also connect models from other CAD packages in SOLIDWORKS with 3D Interconnect. File Management: SOLIDWORKS PDM Standard helps individuals and small workgroups manage project data, control their design revisions, and control access to files, accelerating the design process and increasing productivity. Manufacturing Cost Estimation & Quoting: SOLIDWORKS Costing will save you time and development costs, avoid redesigns, and increase productivity by continuously checking your designs against cost targets with integrated cost estimation tools. On-line Cost Estimates via the MySolidWorks Manufacturing Network. Get instant cost estimates from any manufacturer in the MySolidWorks Manufacturing Network. Standards Checking: SOLIDWORKS Design Checker allows you to establish design standards and easily check drawings (or models) to create uniform designs and related documentation, which speeds up product development, saves time, and increases productivity. Design Collaboration: Use powerful eDrawings® Professional software to increase collaboration, accelerate your design process, and increase productivity by easily viewing and sharing SOLIDWORKS 3D models and 2D drawings in an email-ready format. Task Scheduling: Task Scheduler, a software utility included with SOLIDWORKS Professional puts your system to work while you’re away. It lets you run resource intensive processes (such as batch importing, exporting, and printing) when the computer is normally idle, freeing you to focus on more creative projects. CAD Library: SOLIDWORKS Toolbox provides libraries of prebuilt 3D CAD models and other CAD data that help accelerate the design process, save time and development costs, and increase productivity. Tolerance Analysis: Quickly and easily check dimensions and tolerances using SOLIDWORKS Professional TolAnalyst software to assess the manufacturability of your design long before reaching production. Check parts and assembly tolerances during design, accelerating the design process, saving time and development costs, and increasing productivity. Advanced Photorealistic Rendering: SOLIDWORKS® Visualize Standard enables designers, engineers, and content creators across all industries to create compelling visual content of their designs with unparalleled ease and flexibility. By utilizing photo-quality content early in the design process, more informed design decisions can be made, as well as receiving useful early feedback from sales teams and potential customers. Reverse Engineering: SOLIDWORKS ScanTo3D will streamline the design process using SOLIDWORKS Professional to create new designs—or recreate existing designs—based on ones that already exist. Reverse engineering can accelerate product development and reduce risk, save time, and increase productivity. Design for Manufacturability: Check your design and verify manufacturability of your product early in the development process using SOLIDWORKS Professional, saving time and development costs, improving productivity, and accelerating your time-to-market. Time Based Motion Analysis: SOLIDWORKS Motion easily evaluates how your product will perform and move throughout its operational cycle with motion analysis. Visualize your product moving as it would in the real world and measure the forces and loads on your design. Linear Stress Analysis: Linear stress analysis enables designers and engineers to quickly and efficiently validate quality, performance, and safety—all while creating their design. Reduce the need for costly prototypes, eliminating rework, and save time and development costs. Advanced Surface Flattening: Often products like leather goods, sports equipment, footwear, and products made from composite materials, like carbon fiber and fiberglass, have complex shapes, but are manufactured from materials that start out as flat stock, such as cow hides, nylon, cloth, and flat composite sheet. With SOLIDWORKS Premium you can accurately determine or estimate the size and shape of surfaces in their flattened state in order to be able to cut the material from the flat sheet. Piping and Tubing Design: Accelerate the development process and save time by designing piping and tubing in 3D during system design with SOLIDWORKS Routing. By integrating piping and tubing during the design process, designers can help ensure efficient assembly, operation, and serviceability, avoiding rework, delays, and extra cost. Electrical Cable Harness and Conduit Design: Quickly design and route electrical wiring, harnessing, cabling, and conduit assemblies of products in 3D using the SOLIDWORKS Premium package. Integrating these systems during product design rather than adding them later accelerates your development process, saves time and rework costs, and helps to ensure efficient product assembly and serviceability. Routing of Rectangular and Other Sections: SOLIDWORKS Premium users can route rectangular and round sections to meet their design needs. Equipment designers, product designers, machine designers, facility designers and others all need rectangular section routing to complete their designs that include ducting, cable trays, conveyors, material handling chutes, and many other systems. Contact us to get a tailored SOLIDWORKS Packages Comparison and gain a better understanding of which SOLIDWORKS package best suits your business needs.